If you own a business or commercial establishment, it is only logical for you to want the best in every aspect. One of the most important components of a business is the HVAC system. This is no longer a want, but a need, for all establishments. However, it is undeniable that things can go wrong at one point. And, as a business owner, you would want to remove the high price of commercial HVAC maintenance without sacrificing the good performance of an HVAC unit, regardless of the weather. But, are you tired of the costly commercial HVAC repairs that hurt your budget but never get anything fixed? Do you believe that a broken and faulty HVAC unit can drive potential customers away? Well, it’s time to stop worrying and start taking action. Pick up the phone and call us. Why? We are the best in professional HVAC maintenance for commercial establishments. We can assure you that your air conditioning unit will work well and never malfunction throughout the year. Our years of experience in dealing with air conditioning systems can attest to this. Our dedication to the safety of HVAC units has made our work the best there is. Professionalism, efficiency and reasonable fees? If you are looking for these, work with us. We can give you an unforgettable air conditioning repair experience. With an affordable service fee of $59 (goes up after 8 p.m. and 10 p.m., respectively), our technicians will come to your business to check your HVAC unit right away. Also, if you work with us, we can guarantee that you will never get a “surprise” fee. We will give you a flat-rate price immediately, even before any repairs are made, just to be certain that you are okay with the fee we have stated. Our team of professional, certified and trained technicians will give you a five-star, satisfying experience. We have been in the repair industry for more than a decade and counting now. We have given repairs and maintenance services of high quality, for various air conditioning and heating units. Another bonus? We don’t have an additional fee for Saturday repairs. Plus, we also offer insurance for our repairs. We even have an MVP maintenance plan, taking the commercial HVAC maintenance to the next level. This package is inclusive of quarterly check-ups involving tightening electrical connections, monitoring of refrigerant levels, cleaning of condenser coils, testing of safety controls and checking of all wiring. 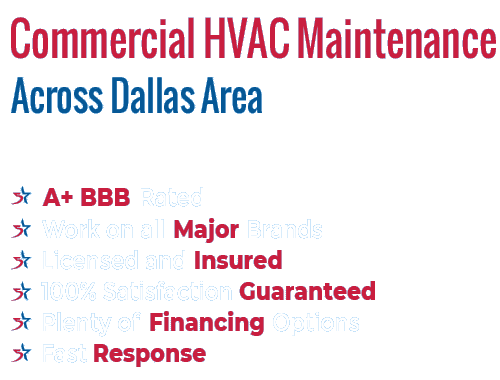 We even have a commercial HVAC maintenance package to make paying convenient for you. You can choose from paying monthly or quarterly, and we will do our job of changing filters, testing all electrical starters, cleaning coils, among many others. We will even take care of labor and needed parts. Yes, you read that right. If your repair needs a new refrigerant or motor, we got it covered. Just ask about the Guaranteed Solutions Program. If you want to maintain a small and reasonable budget for HVAC repairs, we are the company for you. Our Guaranteed Solutions program will give you professional repair and maintenance without worrying about extra fees, because all costs will be covered. All parts will also be installed with a five-year warranty. There is no doubt that our commercial service belongs to one of the best in the market. If your business falls in our service areas – Rowlett, Rockwall, Garland, Richardson, Sasche and Frisco – call us right away. Don’t settle for less. Don’t risk the quality of your HVAC unit by calling a company undeserving of your trust. Choose us and receive the best HVAC maintenance. We offer 24/7 services, 365 days a year!